In 2019, the Open Sud de France event innovates and offers the VOGO SPORT “Live & Replay” solution to all spectators! The Open Sud de France event is a tournament organized by the ATP Tour and RMC (Radio group). Since its creation in 2010, it has become “a reference in indoor tennis worldwide and a major event on the French sports scene” (Sébastien GROSJEAN, Tournament Director). It takes place every year at Sud de France Arena venue in Montpellier. Regarding tennis, the arena has a capacity of 9,000 seats. It also has several courts for a total playing surface of 2,800 m2. The 9th edition of the Open Sud de France is being held over a week, from February 3 to 10, 2019! The tournament welcomes renowned athletes such as David GOFFIN (the “Montreal Diamond”) or the French Jo-Wilfried TSONGA. 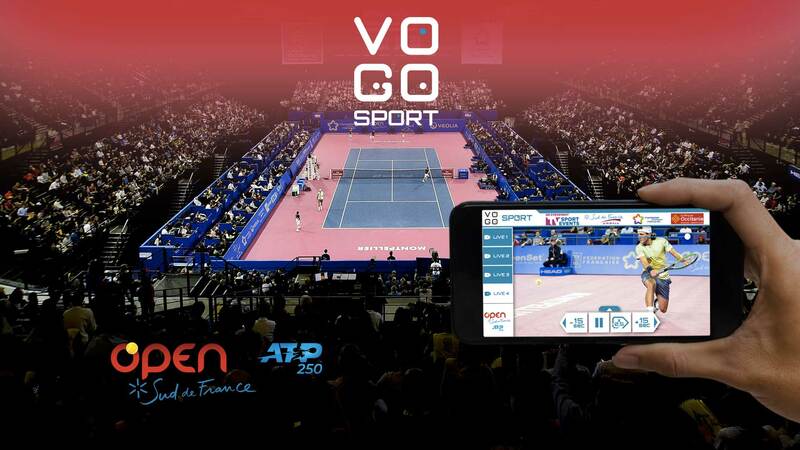 Now the Open Sud de France is offering the VOGO SPORT “Live & Replay” service for all spectators! Thanks to the VOGO SPORT system, which is an in-venue free mobile app, spectators can watch live the best actions on their smartphones and tablets, review points from different camera angles or find exclusive tournament content. A major improvement for all tennis fans at the Open Sud de France! VOGO SPORT is available from Tuesday, February 5th at 2pm and every day from 2pm until finals on Sunday, February 10th. Whether you are residents or visitors, download from now on the VOGO SPORT app and live tennis in a different way! ->You can find here how VOGO SPORT works. Previous post VOGO, winner of 2019 "SPORSORA Trophies"